Happy Solstice! Here in my neck of the woods it’s good and hot—soon to be grindingly humid, which is what passes for a New England summer. Nonetheless, I’m grateful for the extra light and I’m having that deep yearning toward what summer was like when I was a kid. Nothing to do but get our feet dirty. Things are a little different now. I’m having trouble keeping up. By the end of the day yesterday, when I hadn’t found time to write a single word of this post I was in a dangerously dark mood. Pity my husband. It was Father’s Day, and I wasn’t very gracious. Luckily, he was. 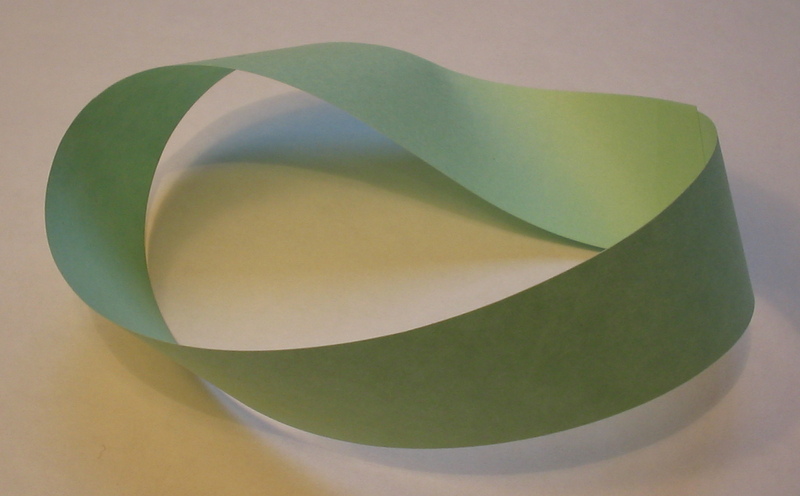 He thinks, by the way, that the way I’m writing this blog is like a mobius strip. I’m not sure if a mobius strip is the proper scientific/mathematical term, but I think I get what he means. I try to stick to a regular narrative, but I can’t. Instead I veer back and forth between two stories: my path to becoming a mother (conception), and the aftermath of motherhood (reality). As I do, I find these overlaps that inform the overarching (twisted?) narrative about my struggle to find my voice as a writer/mother. Not to get too Matrix-y or anything, but it’s like I’m joining the past and present, and in doing so I’m reimagining and recreating myself as I would like to be. I don’t know if that changes the past, but it certainly changes the way I see and judge the past. I think this concept is pretty common in other cultures—I’m sure lots of folks have walked this walk before me. But Pokey Mama is pretty excited about figuring this out, (remember, she’s slow) because I used to think in order for me to become who I wanted to be I had to do away with parts of myself that maybe weren’t so…pretty? Acceptable? Angry? It was important to keep things separate: the peas don’t touch the mashed potatoes; the mashed potatoes don’t touch the chicken. It’s how I treated my body, my art, and when I became a mother, it’s how I (unsuccessfully) tried to manage that, too. I wasn’t Pokey Mama, I was sad mama, frustrated mama, at-times-close-to-crazy mama. I felt confused and in pieces and had no idea how I would continue my life as a writer. Who was I now? What was my subject? Who would care about my “experience”? For a couple of years I’d been thinking about creating a ritual for my next big birthday. I wanted something deeply artsy and symbolic that would mark my history and open the path to my future. For a long time the idea consisted of going away with a few friends and finding a spot by the water to lay down and make an impression of my body. We would then fill the impression with scraps of paper on which I’d written my worst transgressions and faults, and set the paper on fire, leaving the imprint with a dark layer of ash. Hmmm. Kinda cool, but, why the self-immolation? Why the need to erase those troubling parts of myself that may be painful and annoying yet are nonetheless parts of my self? I never completed that ritual. But recently, I had that big birthday. 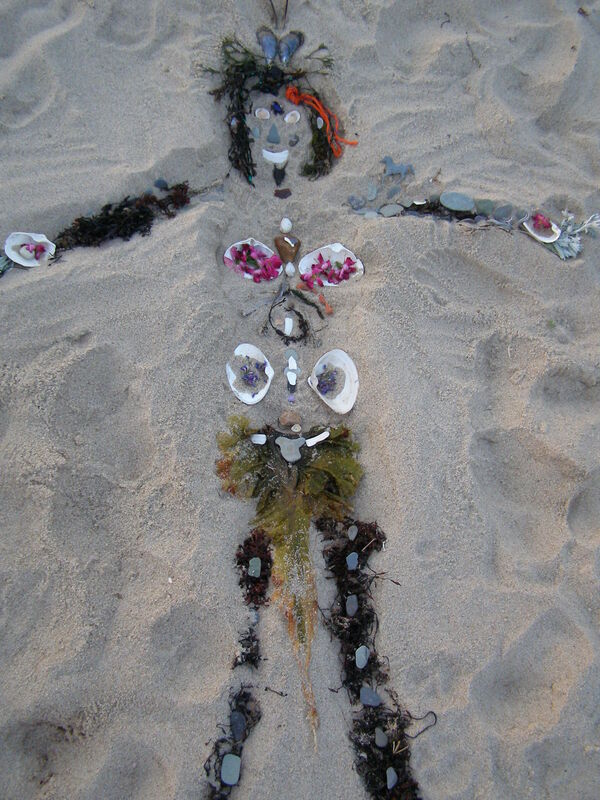 I went to the ocean with my family and on my birthday I lay in the sand and made an impression of my body. 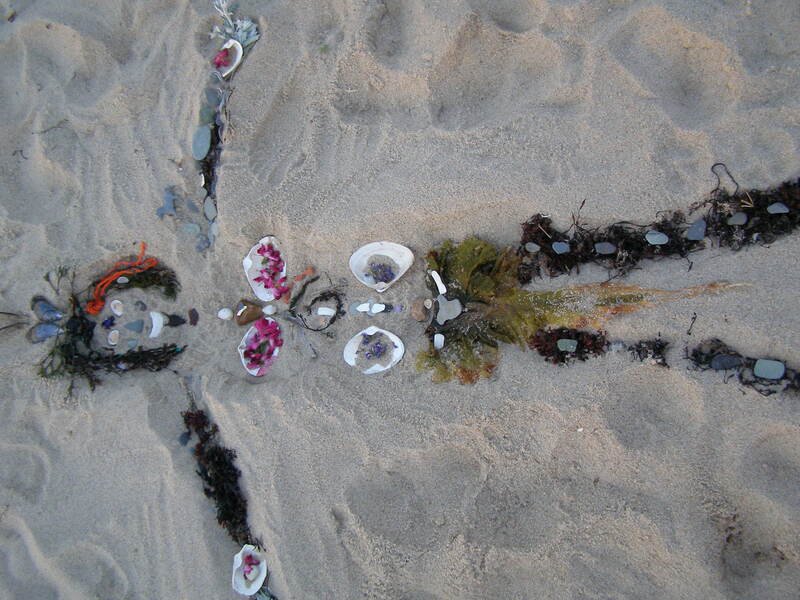 Then my kids and I gathered shells, rocks and bits of glass, rope, seaweed, whatever caught our eye, and we made a mermaidish kind of woman- person in the sand. My son made her a skirt that looks a bit like male anatomy. My daughter made her a warrior’s headdress. I found a piece of blue sea glass for a third eye. We made her above the tide line, so she wouldn’t wash away. We checked on her every day and no one on the beach disturbed her body. No immolation, no drowning, no foul. The process of creating this doppelganger with my children was fabulous. Even more fabulous was the realization that my children could become part of my artistic process, that I could relax a little and not have to guard the artistic part of myself, maintain that seperation, so ferociously. Yes, I know, I’m talking about synthesis again. I told you I would. So, the two threads: my fertility as a woman and my faith in my vision as an artist. How might they be connected? Well, when I was trying to get pregnant I straight off went running to the medical establishment. Help! Help! I’m having trouble getting pregnant!! I’m not denigrating women who go for fertility treatment. I have many friends who’ve had to go this route and endured incredibly difficult circumstances in an effort to conceive. All power to them. But these are women who have already exhausted their other options, whereas I tried to get pregnant without even paying attention to when I was ovulating. I should have got busy with the calendar, marking off the days, and taking care of business at the appropriate time. Instead, I just assumed my body had failed me. I assumed I couldn’t do what needed doing. I assumed I needed an expert. What in my history/upbringing/culture cultivated such alienation from my own body? Such passivity? Truth is, I did need a little help. Luckily, I have good friends, did a lot of reading, got some smart advice. A few months later—plus sign on the pee stick! I wish I could tell you learned my lesson. I wish I could tell you from that moment on I determined to trust myself, stick with my instincts, not let my Self get pushed around by…me? But no, there’s a lot more of these stories to tell—about my body, my art, my confused state of mind, my ongoing tendency to look outside myself for what I already know. Pokey Mama’s a slow learner. Do you remember that Al Franken character, Stuart Smalley? “I’m good enough, I’m smart enough, and gosh darn it, people like me!” Pathetic, right? Except that guy—Al, Stuart— is now a senator. He fought hard for that seat, too. Must’ve been something there that wasn’t just a joke. I love this post just as much as all the others. Honesty, fervor, humor!- and a voice that’s both humble & confident (and oh so y-o-u). And how great that your whole family’s involved in this project – that carving a space to be Pokey Mama the artist doesn’t mean leaving them out of it. I have anger. Sometimes, it’s b/c it’s 2pm and I still haven’t eaten anything, and so who wouldn’t be crabby? But other times it goes deeper, and that’s fine too. Emotions aren’t right or wrong, they just are. Your doppelganger looks divinely serene. I’d like to lay down next to her for a while. I love this piece! I find your insights illuminating, downright inspiring. Since reading it I’ve been walking around with something like poem titles in my head: “Self Portrait as Immolated Woman” and “Self Portrait as Woman Made of Shell and Rope” I also think you’ve got the cover art for your next book, Pokey Mama at the beach! Those are great poem starters! Hats off to you, the doppelganger, and Stuart Smalley. And you do still need the expert, though I think you’ve found her. your story from a while back about fishing with Rowan is in here, even if you can’t see it. Thanks for that.